This past weekend my family wanted lasagna. I wanted garlic bread. There was a loaf of French bread sitting in the freezer that I know would have made some yummy garlic toast, but I wanted fresh homemade bread. And I knew when having a craving for fresh bread that loaf of French bread sitting in the freezer was just not going to cut it. But I did not want to take the day making bread dough and waiting for to rise for an hour or two and then making it into loaves and waiting for time to pass. I wanted something quick. That is where this recipe comes into play. I had found on Pinterest and had pinned it, so I could make it for such an occasion like this. The recipe for the dough is more like a recipe for a pizza crust, so it doesn’t take the time as other yeast breads do. The results are amazing; the bread is soft and has so much flavor. This paired perfectly with the lasagna and I think it would go well with almost any meal, it is that good. Parmesan cheese for sprinkling at the end. Dissolve the yeast in the warm water and stir for a few minutes, add the sugar. Combine 2 cups of flour, garlic powder, and salt in a separate bowl. Add the olive oil and the yeast mixture to the flour mixture. Knead for 2 to 3 minutes; add more flour as needed you will want a stiffer dough. Let the bread rest for about 15 minutes. Take a pinch of dough and roll into a rope about 5 inches long and 1/2 inch thick. Tie the rope into a knot and place on a greased baking sheet. Repeat until you have used all of the dough. Let knots rest in a warm place for 15 minutes. Preheat oven for 12 to 15 minutes or until golden brown. While the bread is baking mix the ingredients for the garlic coating. Once the bread is removed from the oven brush with the garlic coating and sprinkle with Parmesan cheese. Serve bread while it is warm. 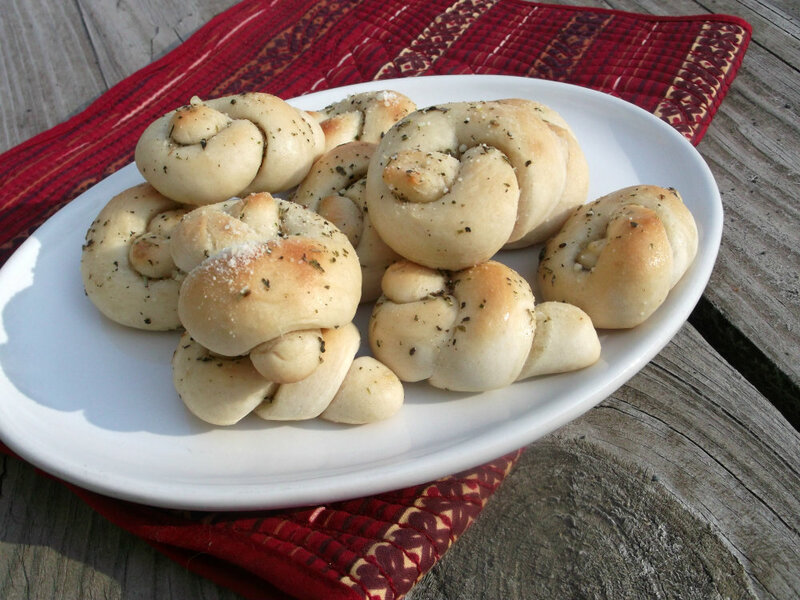 I love making these garlic knots… yours look fantastic! Garlic bread is so tasty, and your knots are very pretty! 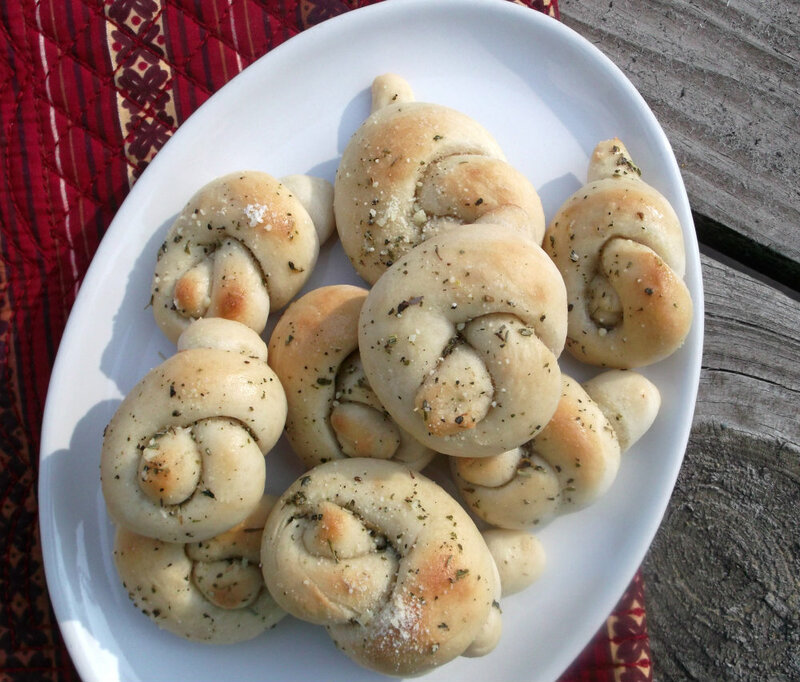 What perfect little garlic knots! They look absolutely delicious and it’s been ages since I’ve had one! Definitely need to make a batch. Good recipe. 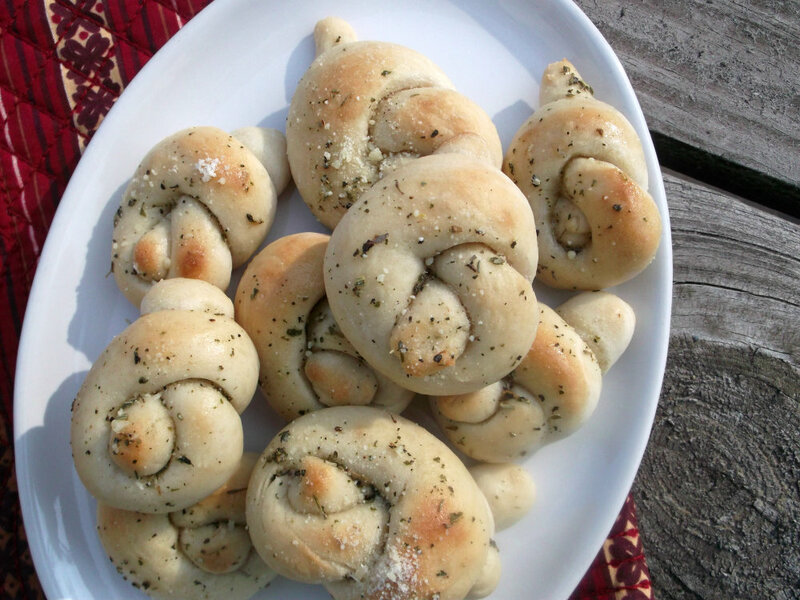 I’ve had garlic knots before, but have never made them. I gotta try this – thanks so much.